The Big Mean Steam Machine started with the following question: is it possible to combine old and new technology? For us characteristics of old technologies are big machines which only have a single purpose, make a lot of noise and are not very practical. On the opposite, new technology tends to be multifunctional, small and practical. As an example of new technology you could take a modern mobile phone, with which you can make a phone call, but also send sms-messages, make photographs, use as an agenda and play music. 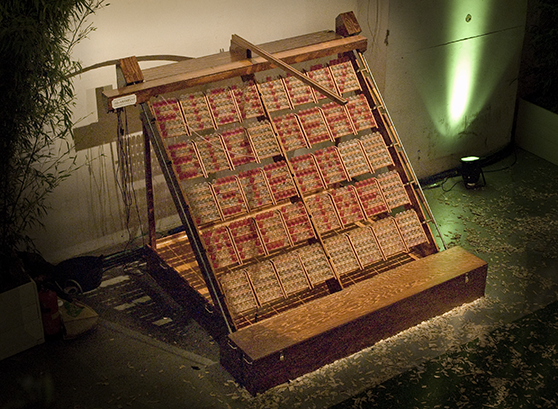 We took one aspect of this new technology, the sms-functionality, and build a huge machine around it using old construction methods and technologies, only able to receive and display sms-messages. 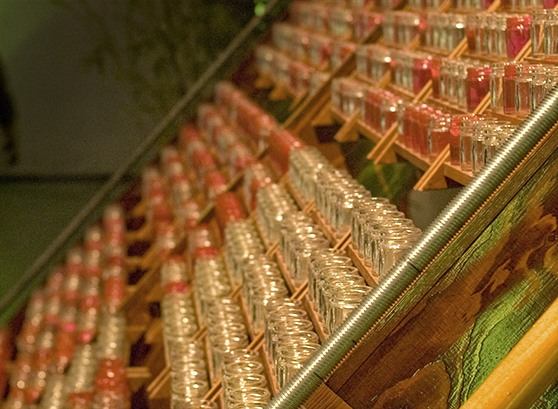 The machine consists of a thousand small glass jars, which are put into arrays of five by five. These jars can be filled with a coloured liquid, turning them into ‘pixels’. This way each array of jars can display a character of the sms-alfabet. The filling of these jars is done by a computer controlled arm that hovers above them. It takes about three hours for one full message to be written. While writing a message the whole machine shakes and makes a lot of noise. When the message is completed, you can erase it by pulling the handles on the right side of the machine. The fluid is emptied from the jars, and collected again in front of the machine, ready to be reused again. The design of the Big Mean Steam Machine is inspired by 19th century machines. New technology is most of the time designed to be aesthetically pleasant, while old technology gets shaped by functionality. Old machines often show their inner mechanics, you can see how the machine works, while new technology tends to hide it. The Big Mean Steam Machine has a quite open structure, only the new technology is hidden in the coffin in front of the machine. The Big Mean Steam Machine is a project by Maarten Bennis, Wim van Eck and Willem van Vliet. We build it during our MSc Media Technology (Leiden University).